Bake 8 to 10 minutes or just until cupcakes spring back when touched lightly in centre. Cool completely, at least 15 minutes. Remove from muffin cups to cooling rack. Using sharp knife, cut top off of each cupcake. Spoon 1 teaspoon pudding onto centre of bottom half of each cupcake. Cover with top halves of cupcakes. 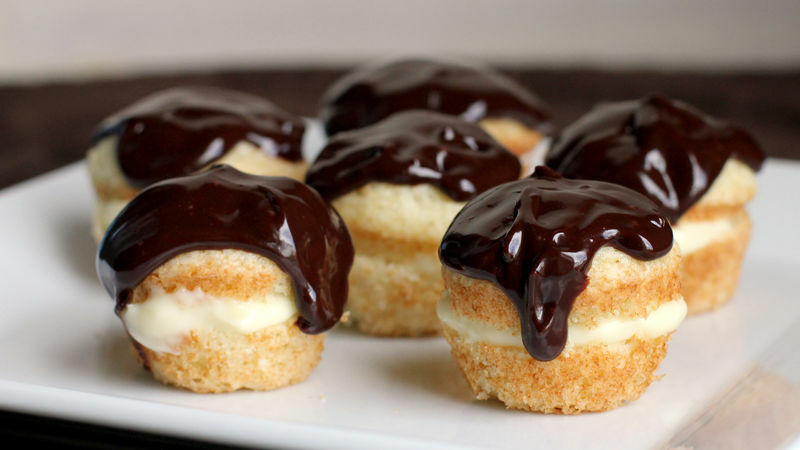 Chocolate Boston Cream Pie. Try this recipe with chocolate cake mix, instead of French vanilla. A great twist on the classic flavour! It's Party Time! These cupcakes make a great addition to any party table! Try toting them to your next holiday party and watch how happy you can make your friends or coworkers!